About a month ago a personal dream came true: I got to see my favourite band live. Friends and followers of this blog should know that Queen has been my favourite band for over thirty years, even before it became cool to admit to being a fan. In fact, their popularity simply surged after Freddie Mercury’s death in 1991, despite the lack of fresh material by the original quartet (not counting 1995’s “Made in Heaven”). “There is no point carrying on. It’s impossible to replace Freddie,” said bassist John Deacon and retired to wife and brood of kids thereafter. Despite being reduced to the two active founding members, the band and their music have never quite left the limelight. Excellent live concert videos from the glory days are being output at a rate similar to their original studio album run. There’s a musical, the usual fare of sanctioned remixes and the odd few collaborations: the last Queen + suffix was no less than Paul Rodgers, a testosterone-laden partnership that resulted in a mediocre album in 2008 and a tour which I missed again! Enter one Adam Lambert, runner-up in the American Idol circus and an established young vocalist in his own right. He started performing with Queen on an irregular basis in 2009; and prior to a tour in 2012 I had never even heard of the lad. Fans got excited. Comparisons with Freddie’s vocal performance followed, as did praise by pundits. Me, personally? Meh. The random YouTube clips I’d seen left me as lukewarm as would a karaoke performance of some random guy on Guitar Hero. Sure, Adam can sing — but he ain’t the messenger of the rock gods. Maybe my expectations are unrealistically high. Not those songs, not with Brian May and Roger Taylor reduced to a backing band. Yeah, whatever. Whatever keeps the cash flowing. Soon enough the band announced tour dates on the continent. Tickets were going fast. 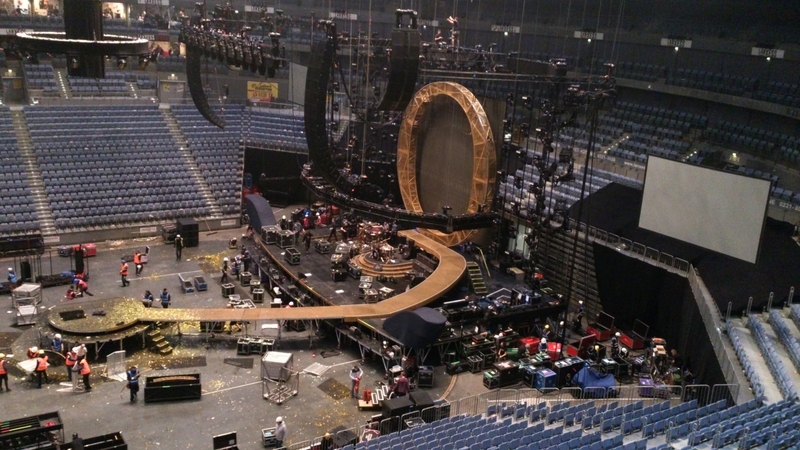 On the evening of the 29th of January I took a drive to Cologne’s Lanxess Arena. Traffic and parking was horrendous. There were concert-goers of all creeds and ages. To many, Freddie Mercury has always been dead. Behind me was seated a (lucky) loudmouth who bragged he’d seen them three times before: in 1982 and twice in 1986, including one of the original line-up’s last concerts in Wembley. Having seen many of their concerts on video, I was weary of what was to come. Fred’s dead, baby, Fred’s dead. There can be only one. The concert was due to begin at 20:00. They were running late. The arena was packed. Elements of Track 13 (an ironic choice) had been looping for about half an hour before the band finally crashed onto the stage with One Vision. By now, I must confess, I was close to walking out! 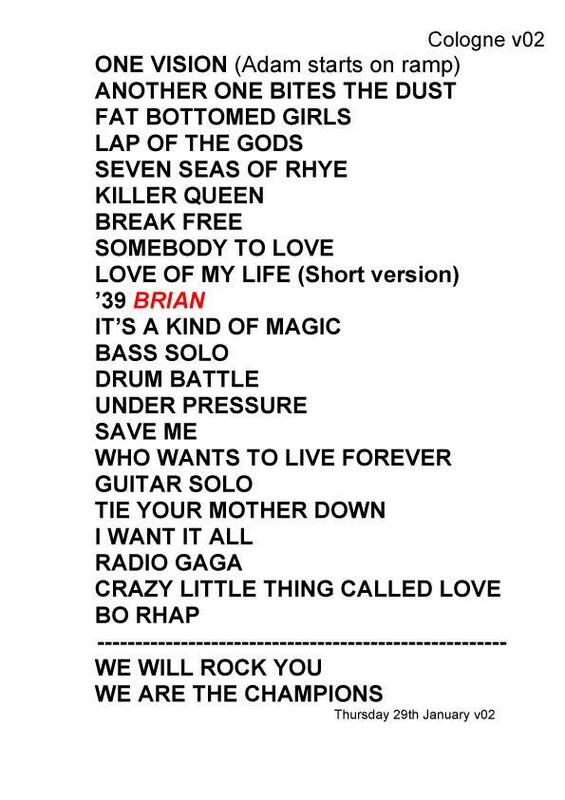 Not those songs, not with Brian and Roger backing someone other than Freddie Mercury. My expectations are unrealistic. What was I thinking? What am I hearing? Cognitive dissonance gave way to delight when Adam Lambert appeared on the extended stage, gay as a daffodil, laying on “a chaise-longue, gently fanning himself and swigging champagne, to perform a killer version of Killer Queen“. His theatrical background serves him well. It worked. Adam Lambert out-camped Freddie Mercury. It’s 24 years since Mercury died. Queen have actually been together longer without him than they were with him. 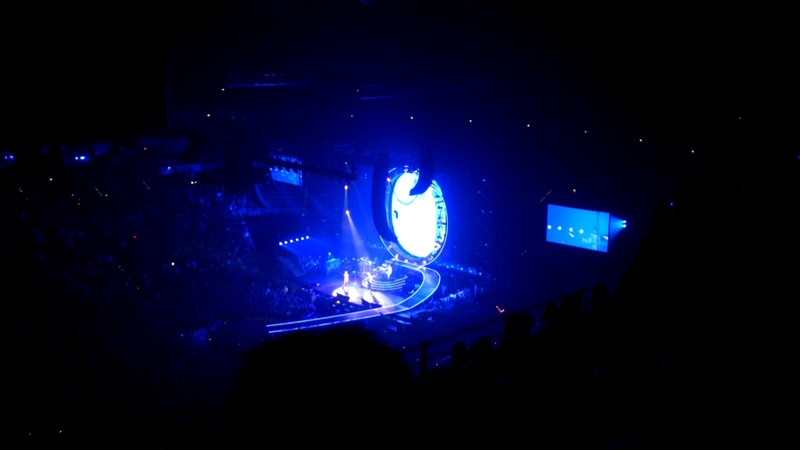 But there is no detaching Mercury from Queen and throughout this packed show […] their painfully missed singer was a constant presence. Following I Want To Break Free and Somebody To Love, Lambert disappeared to leave Brian whip out a selfie stick and film the entire audience before, supported by a video appearance of Freddie Mercury and the crowd, fronting the obligatory acoustic sing-a-long version of Love Of My Life and then getting folksy and unplugged with the rest of the band performing ’39. Crowd pleasers supreme. It was Roger Taylor who then took to the main stage and lead vocals for A Kind Of Magic while his son, Rufus Tiger Taylor, took care of main drumming duties. Up next was a bit of a Bass Solo by stand-in Neil Fairclough incorporating elements of Don’t Try Suicide and Body Language while the audience shouted “John Deacon” before launching into an impressive Drum- and Bass Solo with Roger Taylor. Afterwards, Roger and Rufus got into a Drum Battle whereupon Lambert re-appeared for a stellar version of Under Pressure: Roger hit the skins and sang the Bowie parts while Adam reached for mercurial heights. If Roger’s tantrums hadn’t already done so by now, Dr. May proceeded to prove that the two geezers still had it when he leaned into his usual self-indulgent Guitar Solo, featuring parts from Last Horizon but not before forcing the most gruff and monstrous sounds out of his legendary Red Special guitar. This was the jaw-dropper! Awesome stuff. Nothing serves as a better warm-up for the next song. Bohemian Rhapsody: Well, what’s to be said about one of the most mind-blowing and famous songs ever? Adam handled the first few lines and was again joined by the ghost of Freddie for the rest. As has become their trademark, the operatic section was not played live (too many Galileos). The song was a multimedia group effort of epic proportions. The expected encore consisted of We Will Rock You (slow) and We Are The Champions. And that was it. The show was over. The light show was superb. God save the Queen. The crowd disappeared, the stage started getting dismantled, leaving me to ponder about what I had just experienced. I felt like a half-empty glass of the finest wine. They’ve made it very clear that Adam Lambert is not a replacement for Freddie Mercury. He’s not mimicking him, he’s not pretending to be him. What he has done is brought some vitality to two ageing veteran rockers that were looking for a reason to get their circus back on the road and return to the fans. Adam is simply a very suitable performer who plays a key part in the show that Queen have become: a tribute band to their fallen front man. This entry was posted in Music and tagged concert, dream, live, Queen. Bookmark the permalink.